The Latitude 15 3590 is a budget business device manufactured by Dell. It is meant to cover the most important security features of the Latitude line up while keeping the costs low. This, according to Dell, makes it the perfect laptop for growing businesses and we are here to test that. Of course, when you want to keep the price down, you have to make compromises either with hardware, or other areas. Well, Dell did that in a reasonable manner. The unit we are about to review has the agility of the Coffe Lake ULV chips – Core i5-8250U, to be precise. At the same time, it is equipped with a Full HD TN panel, which is a pity, given the fact that there are laptops in this price range which include an IPS one. Moreover, it lacks the distinctive joystick and dedicated mouse buttons. Nevertheless, we are sure that everyone doubts the point of this joystick anymore, so no love lost here. One of the most prominent features is actually the fact that you get a three-year Next-Business-Day warranty from Dell, wherever you are, which is extremely important if you use your laptop for work. Inside the box, we found everything one needs to survive an apocalypse – a knife, cans of food and a Latitude. Joke aside, there was nothing interesting inside, except the laptop itself and the 65W charger. When it comes to build quality, Latitude devices never disappoint. However, the materials used to build the Latitude 15 3590 are not exactly exquisite. Although the notebook looks and feels sturdy, it is prone to cracks and internal damage in eventual drops. In addition to that, the device is not the thinnest either with its 22.7mm profile. Its measurements are pretty standard for a 15.6-inch laptop – 380 x 258 x 22.7 (14.96″ x 10.15″ x 0.89″) and it weighs 2 kg (4.4 lbs). Opening the lid is a tough job for a single hand, so the other one might be useful. The lid itself has a little bend to it but it is normal, considering the plastic material. Looking at the base of the Latitude 15 3590, you can see a refined simple design, which we really like. The keyboard is full-sized and illuminated. In addition to that, it has a fast feedback, although the key travel is a bit short to our likings. Moving down, we see the touchpad which is nothing spectacular visually. However, it is super responsive and the keys are easy to locate and fast to respond. Last but not least – the I/O panel. First, we’ll take on the left side. Starting from back to forth, there is the power connector, accompanied by a USB Type-C which supports DisplayPort output. Next, we have an HDMI connector, as well as an RJ-45 one, followed by a USB 3.0 Type-A and a 3.5 mm combo jack. On the opposite side, things look easier – a VGA port, single USB 2.0 port and an SD card reader. It is here that the optional Micro-SIM card slot could be. Like every other Latitude, this one is easy to upgrade/clean. First, you need to unscrew the 10 Phillips head screws located on the bottom of the device. Keep in mind that they will stay on the panel after you unscrew them. Then you just need to pry the bottom plate up and you’re done. From the image below you can see the size of the hinges, which offer a very good support for the screen. In the next image, you can see the cooling solution, which consists of a single heatpipe, a small heatsink, and a tiny little fan. The latter happens to like attention, so you are bound to hear a lot from it even at minor load. Right next to it are located the two RAM DIMMs, which support up to 32 GB of DDR4 memory. Next, we show you a the 56Wh battery unit. As you can see, its four cells take more than a third of the space inside the laptop. Finally, there is the M.2 SSD drive. It is located to the right of the battery and the label reads Micron 1100 SATA SSD 256 GB. However, the choice of SSDs is strongly dependent on the region so we cannot assure you that you’ll receive the same drive as we did. Moreover, the Latitude 15 3590 also supports the faster NVMe drives. In addition to that, there is a SATA connector for more storage, which you can find right next to the CPU cooler (visible on the pictures above). Dell Latitude 15 3590 is equipped with a Full HD (1920×1080) TN panel with 15.6-inch diagonal, pixel density of 142 ppi and 0.18 x 0.18 mm pixel pitch. The panel in use is the same as in last year’s Latitude 15 3580 – AUO B156HTN03.8. It can be considered as “Retina” when viewed from at least 60 cm. Sadly, the display is a bit dim with a peak brightness of 220 nits in the center of the screen and also 220 nits as an average across the surface. Maximum deviation is 7%. The correlated color temperature at maximum brightness and white screen is 7000K – colder than the sRGB standard of 6500K. Things get even worse along the grey scale, where the color temperature reaches 15000K – cold, bluish light. You can see how these values change at 140 nits (61% brightness) in the image below. Latitude 15 3590’s display struggles to reproduce only half of the colors in the sRGB color gamut. Our “Design and Gaming” profile delivers optimal color temperature (6500K) at 140 nits luminance and sRGB gamma mode. We tested the accuracy of the display with 24 commonly used colors like light and dark human skin, blue sky, green grass, orange, etc. You can check out the results at factory condition and also with the “Design and Gaming” profile. Pulse-width modulation (PWM) is an easy way to control monitor brightness. When you lower the brightness, the light intensity of the backlight is not lowered, but instead turned off and on by the electronics with a frequency indistinguishable to the human eye. In these light impulses, the light/no-light time ratio varies, while brightness remains unchanged, which is harmful to your eyes. You can read more about that in our dedicated article on PWM. Thankfully, this panel doesn’t use PWM to modulate its brightness at any point, which is a prerequisite for comfortable use even for extended periods. Dell Latitude 15 3590 is only sold with TN panels of which this is the better one, being with a Full HD resolution. Despite the usual setbacks of a budget TN panel like the poor contrast, terrible viewing angles and lack of colors, there are some merits. These are the speed of the panel and the lack of PWM adjustment. Moreover, color accuracy drastically improves with the use of our Gaming and Web design profile. The sound emitted from Dell Latitude 15 3590’s speakers is on point with clear low, mid and high frequencies. As always, the battery tests were run with Windows power saving setting turned and Wi-Fi turned on, and the screen brightness adjusted to 120 nits. The 56Wh battery does a very good job, especially in web browsing, providing the laptop with enough power for 11 hours and 46 minutes – quite impressive. However, times fall down to 7 hours and 20 minutes when watching videos, and two hours and a half when playing away from the plug. Web surfing – In order to simulate real-life conditions, we used our own script for automatic web browsing through over 70 websites. Here you can see an approximate comparison between the CPUs that can be found in the Dell Latitude 15 3590 models on the market. 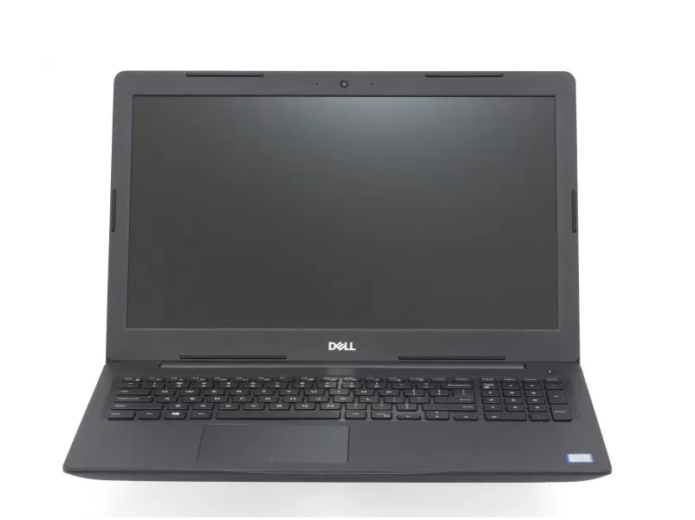 This way you can decide for yourself which Dell Latitude 15 3590 model is the best bang for your buck. Here you can see an approximate comparison between the GPUs that can be found in the Dell Latitude 15 3590 models on the market. This way you can decide for yourself which Dell Latitude 15 3590 model is the best bang for your buck. Dell Latitude 3590 is equipped with a Micron 1100 SATA SSD that delivers Read and Write speeds of respectively 524.7 MB/s and 506.9 MB/s – result inherent to a SATA drive. Dell Latitude 15 3590 is obviously not a gaming notebook, so the results are nothing shocking. Lower the resolution, disable almost all eye-candy, and you can enjoy some not very demanding titles like CS:GO and DOTA 2 for example. Dell Latitude 15 3590’s Core i5-8250U idled at stable 42C. When the test began, the CPU was able to maintain 3.2 GHz for a couple of seconds, when it fell to 3.0 GHz up until the 15-second mark when something weird happened. Out of nowhere, the temperature reached 97C and the frequencies fell down to around 500 MHz. It left us scratching our heads, but this means that the Latitude 15 3590 favors stability and responsiveness in system apps or manipulations of heavy files in programs like Adobe Photoshop. However, after the temperatures dropped down to 62C, the clock speeds started to return their strength and gently climbed back to 2.5 GHz at temperatures around 82C. Finally, as for the final part of the session, Intel Core i5-8250U’s clock speeds fell a little bit to 2.4 GHz. The average temperature for the entire torture was 84.5C, which is relatively high, but this was probably the most informative test, performance-wise. First, we have to note that when we ran the benchmarks we saw the first run to be the lowest one by a lot… every time. So now we know why – after around 10-15 seconds of near maximum performance, thermal throttling kicks in aggressively and cuts the balls of the CPU. After that, the system needs some time to come to itself before it starts to deliver again. And moreover, it comes back with higher clock speeds at the third benchmark than most of the competition equipped with Core i5-8250U. When we take surface temperatures into account, Latitude 15 3590 is one of the hotter business devices. While this is expectable due to the higher clock speeds and internal temperatures, it is not acceptable for a laptop in this segment. Although the chances are very low that you put 100% load on this device, it is still hotter than what we are used to. Dell had a lot of issues to register when building the Latitude 15 3590. The model it substitutes – Latitude 15 3580 had a lot of problems such as flimsy build quality, lack of M.2 slot and more. This is unacceptable in the battle of entry to mid-level business solutions. However, this year we are happy to say that Dell has not done a terrible job! As we said earlier, they’ve included an M.2 SSD slot that supports NVMe drives – itself being a huge step forward. There is also a slight improvement in terms of build quality, while it is still not on point with the direct competition of the fresh Lenovo ThinkPad E580 and HP ProBook 450 G5. Actually, there are more things that Dell has done right with the Latitude 15 3590 but falls short of their opponents by just a hair. For example, the input devices feel okay but they still drag behind the beautiful ones found in the ThinkPad, in addition to the lack of dedicated touchpad buttons. Sadly, they’ve opted to use the same awful TN panel as last year, while Lenovo uses an IPS panel for their ThinkPad E580. The only positive thing about it is the lack of PWM adjustment and fairly fast response times. However, there is another feature that Dell kept, and this time – in a good way. We are talking about the battery life, which will last you way beyond your workday. Lastly, we can’t help but talk about the strange thermal management used for this laptop. While performance-wise, it delivers better than the ThinkPad E580 by a fair margin and also keeps higher frequencies during extended extreme workloads, it is weird how it bumps the clock speeds to 500 MHz after no more than 15 seconds. In addition to that, it keeps high overall temperatures and like last year’s model, the fan kicks in pretty frequently.